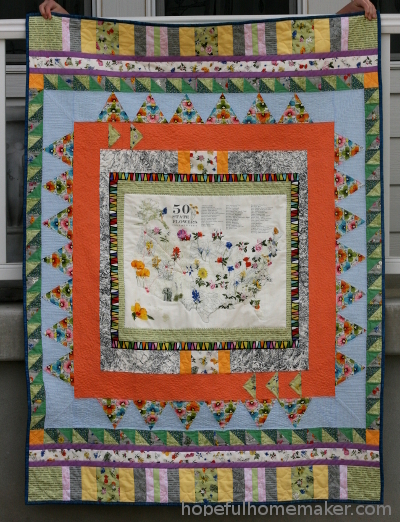 I am so happy to share this State Flowerscape quilt today! I have followed Kirsten Brinton (@turnofthecenturies) on Instagram for some time. Her artwork is meticulous and beautiful. I watched with interest when her family made a cross country move a while ago that landed her in one of my favorite places, Tacoma Washington. I love seeing her photos as they are little glimpses at a place I lived and loved many years ago, and last summer we discovered that we share a birthday! Pretty much I’m a fan of everything Kirsten does and really admire her work. 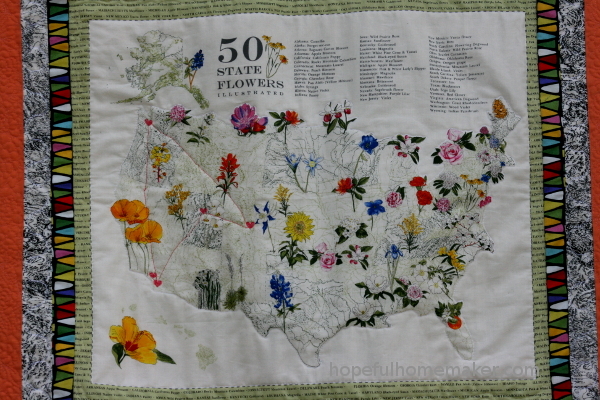 She draws the most beautiful maps, temples, and a gorgeous map of the United States, illustrated with the state flower for each state. When this beautiful print became a fabric panel I jumped at the chance to sew with it. Kirsten sent me the panel and pieces of most of the other prints in her debut collection for Moda, State Flowerscapes, and I have have loved sewing with it. 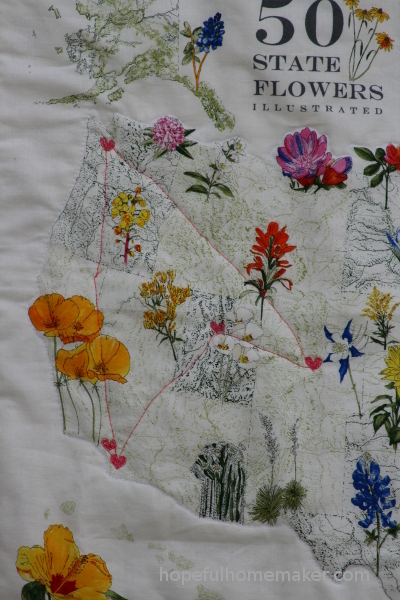 I knew that I wanted the map panel to be the central focus of my quilt so I began building around it, medallion style. 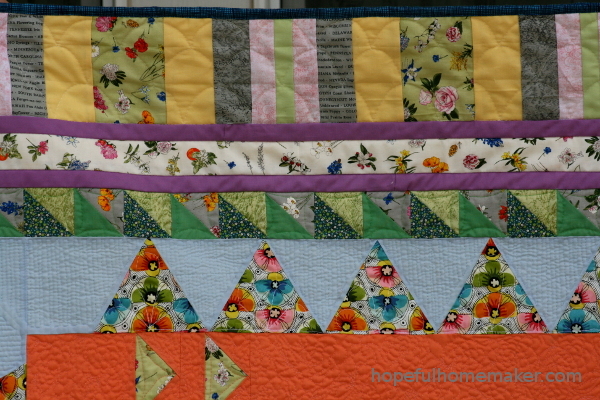 I added a few other fabric prints from my stash like the colorful triangle print by Alexander Henry, but I limited myself largely to solid colors so that Kirsten’s fabrics would take center stage. The creative challenge of using a variety of solids was interesting as I didn’t have a master plan when I started, but instead let the design and color of each border evolve as I went. I also wanted to personalize the map a little, so when quilting I tried my hand at “thread drawing” by stitching hearts where my husband and I were each raised, where we met, and where we are raising our family. To me, it’s a fun mini-story. 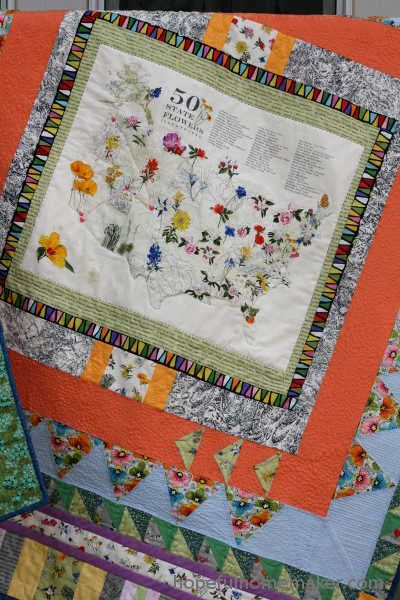 Kirsten’s collection consists of the map panel, topography designs, the floral print, and a text print of all the states and their flowers. Each of these is available in three colorways. My favorite ended up being the flower print in gray and white. 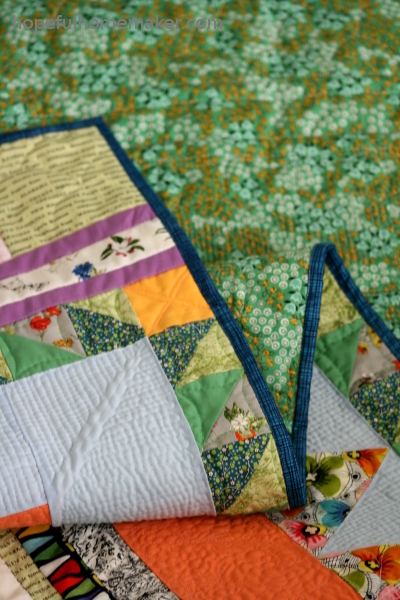 I quilted the quilt on my domestic machine with several different designs, all of them VERY “organic”. Every time I do this I wonder if someday I might enjoy learning longarm quilting. 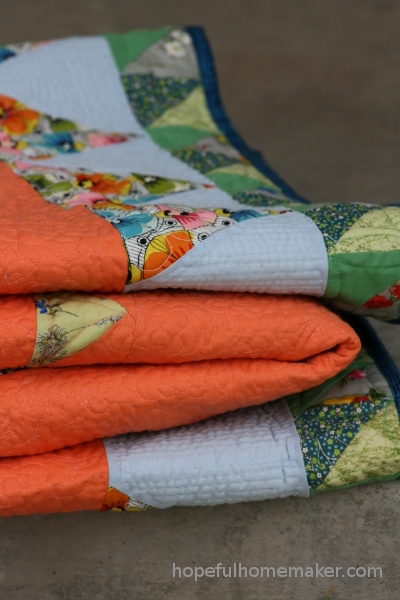 I’ve been feeling the pull of medallion quilts lately. 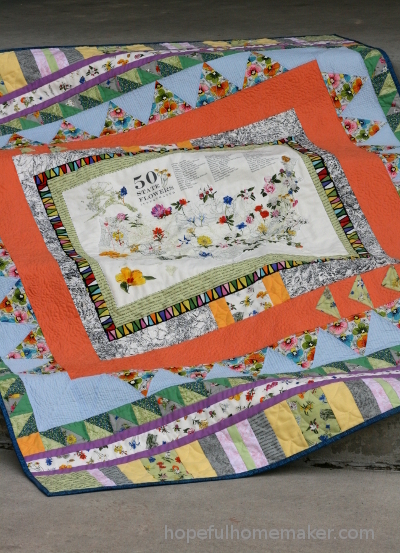 I really love the way each border changes as you add another, and this quilt was no exception. 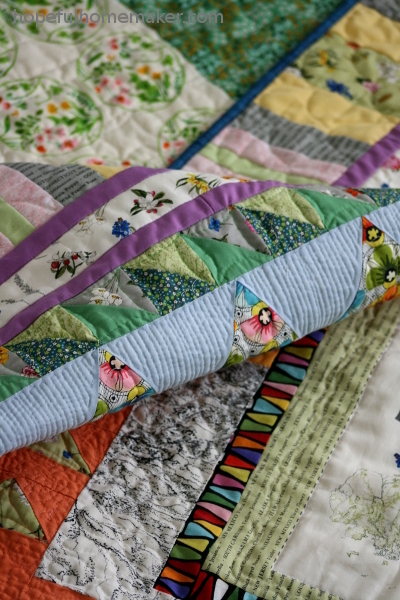 My favorite borders are the half square triangles in different greens and gray, and the flower strip bordered by purple at the top and bottom of the quilt. They really make me smile. For the backing I used a small Juliana Horner floral print and a strip of Heather Ross’ tiger lily, and framed it all with a rich blue binding. Although the fabric collection is rather subdued as a whole, all of it works well with a range of colors. I wanted to infuse it with as much color as I could manage, as that’s what flower gardens are to me: masses of color splashed together, all playing off each other beautifully. Wouldn’t it be lovely to see all 50 of these flowers together? 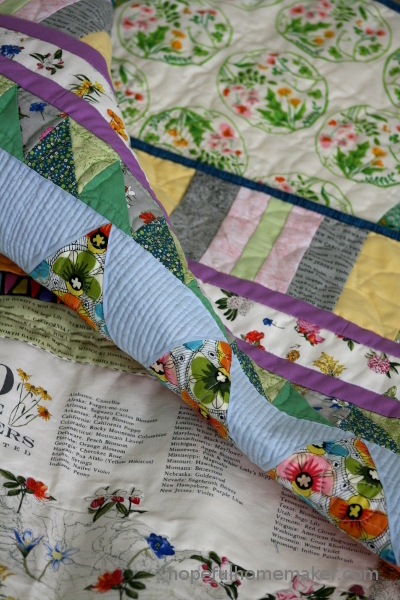 This quilt makes me feel like spring is on the way! Hooray! 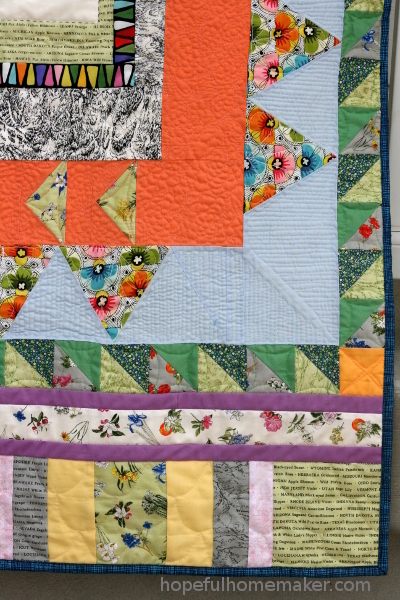 I’m in love with the floral print triangle fabric that is paired with light blue in the 5th border. Is it part of her line? I think I “need” to add it to my stash! Bonnie, that floral print is an Alexander Henry print called Fabrizia. I found it at my local JoAnn’s. I love it, too!